Successfully Added ELE USB Wired Optical Gaming Mouse 6D With DPI - 7 Color LED Backlight, Adjustable DPI, High Performance Sensor, Plug and Play to your Shopping Cart. Level up your gaming experience with the magnificent ELE USB wired optical gaming mouse 6D. Allowing you to switch in between 7 different colors this LED gaming mouse is guaranteed to spice up your gaming experience. Thanks to its extraordinary design this gaming mouse truly does create stunning visual effects that look great from both the side and top of the device. 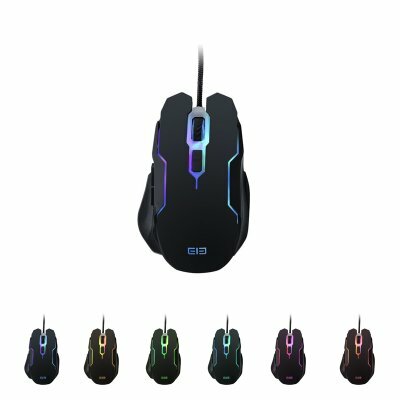 Although designed with gaming in mind, the ELE USB wired optical gaming mouse 6D can also be perfectly used for regular computer usage and office work – providing you with all the means to spice and color up your day at the office. This USB gaming mouse features a comfortable design that is guaranteed to provide optimal support and comfort to the hand. Holding up to 6 configurable buttons this LED gaming mouse lets you use it in the way that meets your needs in the best possible manner. Featuring a 4 gear DPI switch the ELE USB wired optical gaming mouse 6D additionally lets you switch in between 800 / 1200 / 1600 / 2400 DPI, guaranteeing convenient usage and an optimal gaming experience. Its nylon braided USB cable lets you easily connect the mouse to your computer by means of plug and play technology. Equipped with an anti-interference magnetic ring you can be assured that this USB mouse delivers the fastest reaction speeds out there. Its rubber roller features a stylish anti-slip layer and the two back and forward keys placed at the side of the mouse allow you to quickly and effortlessly browse through files, e-mails, or the web – making this LED mouse not only suitable for gaming but also for upgrading your overall productivity while browsing the web or writing up files. Being compatible with Windows PCs, Laptops, and Android devices such as TV boxes, this mouse truly is a multi-functional device that is ought to spice up your user experience with stunning visual color effects. The ELE USB wired optical gaming mouse 6D comes with a 12 months warranty, brought to you by the leader in electronic devices as well as wholesale electronic gadgets..
Arabic: - الفأر - Chinese Simplified: - 游戏鼠标 - Czech: - Herní myš - Dutch: - Gaming Mouse - French: - Souris de jeu - German: - Gaming-Maus - Hebrew: - עכבר - Hindi: - गेमिंग माउस - Hungarian: - Utcagyerek egér - Italian: - Mouse da gioco - Japanese: - ゲーミング マウス - Korean: - 게임 마우스 - Malay: - Permainan tetikus - Norwegian Bokmål: - Gaming Mouse - Romanian: - Gaming Şoarece - Russian: - Игровые мыши - Spanish: - Ratón para juegos - Thai: - เมาส์เล่นเกม - Turkish: - Gaming fare - Vietnamese: - Gaming Mouse.